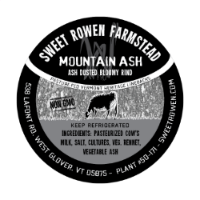 We are a grass-based, family owned & operated dairy farm located in the North East Kingdom of Vermont, about 20 miles south of the Canadian border. 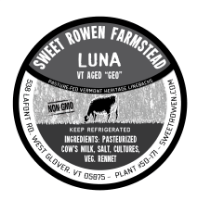 We milk a small herd of Randall Lineback cattle, a heritage Vermont breed. Our barn is situated between woodlands and several rich fields where we grow & cut our own hay. 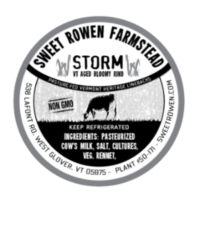 Sweet Rowen began selling milk in 2011, bottling a small volume each week at a rented facility in Albany, VT. In September of that year, the bottling room was lost in a devastating fire, forcing the farm to reconsider our options. We decided to build our own creamery on our family land, enabling us to bottle all of our milk on-site and sell it locally. The creamery opened in May of 2012 and is now cranking out small batches of delicious, non-homogenized milk and fresh cheese. Our happy herd loves munching grass and isn’t afraid to let everyone know! 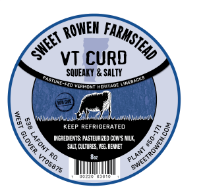 Squeaky, salty, buttery chunks of fresh “cheddar’d” and milled curds are a farmstead classic. They are best eaten fresh when they still have their squeak, but as they age they become more like mild cheddar or mozzarella. They are delicious for snacking, pizza topping, grilled cheese, nachos, and of course poutine! Soft-ripened bloomy rind cow’s milk cheese similar to brie or camembert. It is soft, buttery, tangy, creamy, and luscious. Storm is a very elegant cheese to nibble on with charcuterie, crackers and your favorite local beverage. 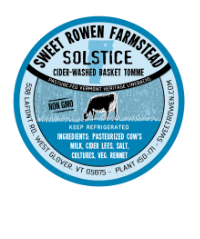 A Sweet Rowen original, this basket tomme-style cheese is delicately washed with Eden Ice Cider lees (the dregs of a cider make). Aged for at least 90 days, this cheese has an initial yeasty and salty taste, with a sweet lactic finish. Made in the same style as Storm but lightly dusted with a layer of fine ash for a piquant flavor. Some people are reminded of blue cheese as it suggests smoky flavors. It is not only delicious but absolutely beautiful on a cheese plate. A semi-soft “Geo”-ripened cheese, with an unctious texture and a hearty, umami-rich flavor profile. Aged for two weeks, with sweet floral undertones, this cheese would perfectly pair with a nice, crisp American lager. 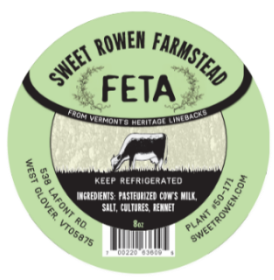 Creamy and salty feta made with our rich cow’s milk is unlike any feta you’ve ever topped a salad with! It’s also great with eggs and pasta salads! SImilar to cream cheese, but without the added cream. This fresh, tangy, spreadable cheese comes in a variety of flavors. 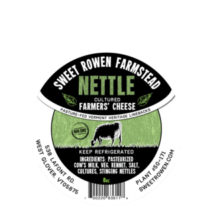 Try Garlicky Tomato, Vermont Herb, Hot Farmer (spicy), Lightly Salted, or our award-winning Nettle.